1 x AltBerg Leder Gris, MOD Brown Nourishes, Protects & Feeds Leather. contains 70% wax, 30% oils (large tin) approx 80g. Leder-Gris® Original is a mixture of 70% wax and 30% oil. It has been developed for everyday use in average UK conditions. The wax provides waterproofing, as it dries – it remains on or just below the surface. Medium oil content: restorative levels of leather oils are average High wax content: waxes are a mixture of synthetic bees waxes – content is above average Regular use: Leder-Gris® Original can be used regularly – it will not over-soften , or damage leather if used excessively. If leather shows signs of hardening, or flex cracking, use a single treatment of Leder-Gris Xtreme – which is an occasional use restorative treatment. Not tested on animals. Flammable Keep out of reach of children – if swallowed, seek medical advice Avoid contact with eyes and mouth. 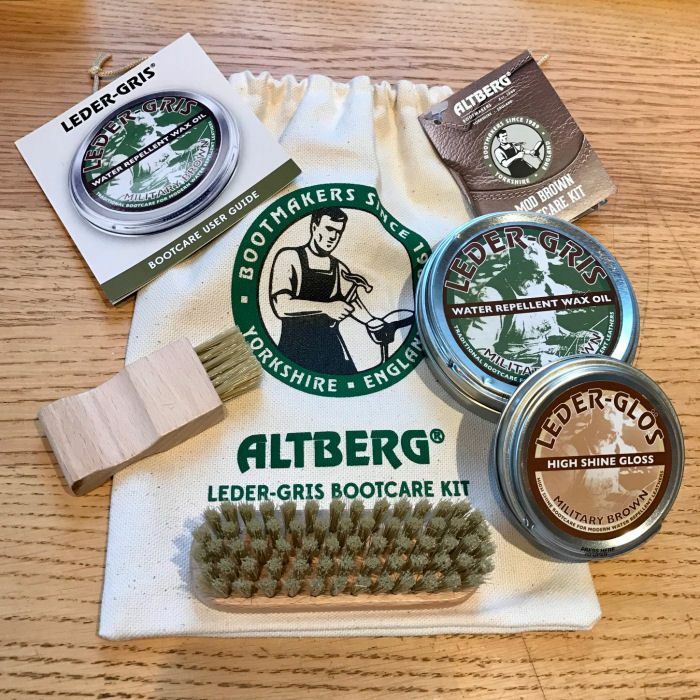 Alt-Berg only recommends Leder-Gris – we DO NOT recommend dubbins, saddle soap, or any kiwi type polishes All leather will eventually show signs of cracking where the boot flexes. Treatment with Leder-Gris® will slow down the rate at which this cracking will occur. Drying boots too quickly will harden the leather and accelerate flex cracking - rapiddrying may also shrink the boot and alter the fitting. Always let boots dry naturally in a cool place. Drying boots too quickly can shrink them - if you're in a very hot climate, cover the boots with a damp cloth to slow down the rate of moisture evaporation Use Leder-Gris® Original (green label) regularly Use Leder-Gris® Xtreme (red label) occasionally.